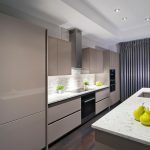 How To Decorate A Modern Kitchen | Bow Valley Kitchens Ltd.
Modern kitchens are definitely “in”– thanks largely in part to their classic appeal that makes them desirable to homeowners around the world. Unlike quainter kitchen styles (think “country farm” and “shabby chic”), modern kitchens are designed to look sleek, clean, and perfectly placed in any modern home. If you want to know how to decorate a modern kitchen to the best effect, take a look at these great tips. One of the best ways to add a truly modern aesthetic to your custom kitchen is to add some shine into the space. For a high quality shine, look for polished chrome and polished nickel finishing, which can be found on everything from appliances, counter tops, or even as accents to appliances and counters. The amount of polished shine you add will depend on the rest of the kitchen and your personal tastes; but most current modern kitchens keep chrome and nickel finishing to accents to avoid overwhelming the space. Modern kitchens are the perfect time to get experimental with your lighting. The key feature of any lighting in a modern kitchen is that it should help the room look bright and open–it’s how you achieve that look that is truly up to you. You can go for statement pieces or simple block lights or something in between. Just be sure to avoid anything that looks dated or overly decorated to keep the modern aesthetic pure. Too many modern kitchens are only black, white and shades of gray. You can add uniqueness and color to your modern kitchen by adding some pops of color, whether it’s a bold shade of blue or a softer pastel pink. A good rule of thumb to follow for adding color without detracting from the modern kitchen design is to keep the color to accents–such as a single accent wall, colourful knife blocks or fruit bowls, or even alternating color cabinets. Your modern kitchen should look sleek and clean–not sterile. You can reduce the sterile look of a modern kitchen by bringing in touches of greenery or wood to liven it up with a touch of the outdoors. You don’t want to go overboard, but small touches like a nice wooden knife holder or vase with fresh flowers can really make a difference in the feel of your kitchen. If your kitchen wasn’t built with a modern aesthetic in mind or you don’t like the current look, it will take some custom work and renovations to get it looking perfectly sleek and contemporary. You should use a professional kitchen renovation and custom cabinet installer to help you get the perfect modern kitchen you’ve always dreamed about. 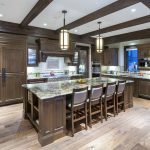 If you have any custom kitchen or modern kitchen cabinet questions for our design team, please be sure to stop in to one of our 2 showrooms located in Canmore and Calgary. Let us help you build your dream kitchen.